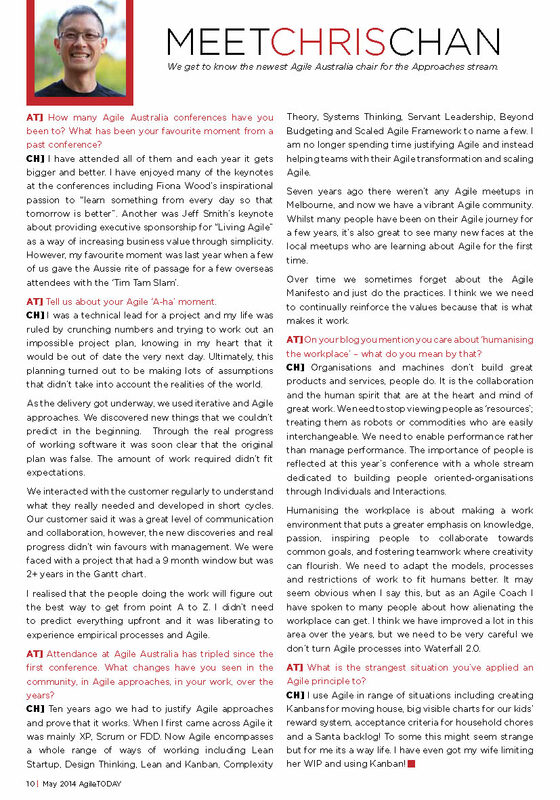 In the last issue of AgileTODAY, I was interviewed by SlatteryIT to find out more about myself as one of the Agile Australia chairs. For Agile Australia 2104 I was one of the chairs for the ‘Approaches’ stream and in 2015 I will be chairing the ‘Build Measure Learn’ stream. [AT] How many Agile Australia conferences have you been to? What has been your favourite moment from a past conference? [CC] I have attended all of them and each year it gets bigger and better. I have enjoyed many of the keynotes at the conferences including Fiona Wood’s inspirational passion to “learn something from every day so that tomorrow is better”. Another was Jeff Smith’s keynote about providing executive sponsorship for “Living Agile” as a way of increasing business value through simplicity. However, my favourite moment was last year when a few of us gave the Aussie rite of passage for a few overseas attendees with the ‘Tim Tam Slam’. [AT] Tell us about your Agile ‘A-ha’ moment. [CC] I was a technical lead for a project and my life was ruled by crunching numbers and trying to work out an impossible project plan, knowing in my heart that it would be out of date the very next day. Ultimately, this planning turned out to be making lots of assumptions that didn’t take into account the realities of the world. As the delivery got underway, we used iterative and Agile approaches. We discovered new things that we couldn’t predict in the beginning. Through the real progress of working software it was soon clear that the original plan was false. The amount of work required didn’t fit expectations. We interacted with the customer regularly to understand what they really needed and developed in short cycles. Our customer said it was a great level of communication and collaboration, however, the new discoveries and real progress didn’t win favours with management. We were faced with a project that had a 9 month window but was 2+ years in the Gantt chart. I realised that the people doing the work will figure out the best way to get from point A to Z. I didn’t need to predict everything upfront and it was liberating to experience empirical processes and Agile. [AT] Attendance at Agile Australia has tripled since the first conference. What changes have you seen in the community, in Agile approaches, in your work, over the years? [CC] Ten years ago we had to justify Agile approaches and prove that it works. When I first came across Agile it was mainly XP, Scrum or FDD. Now Agile encompasses a whole range of ways of working including Lean Startup, Design Thinking, Lean and Kanban, Complexity Theory, Systems Thinking, Servant Leadership, Beyond Budgeting and Scaled Agile Framework to name a few. I am no longer spending time justifying Agile and instead helping teams with their Agile transformation and scaling Agile. Seven years ago there weren’t any Agile meetups in Melbourne, and now we have a vibrant Agile community. Whilst many people have been on their Agile journey for a few years, it’s also great to see many new faces at the local meetups who are learning about Agile for the first time. Over time we sometimes forget about the Agile Manifesto and just do the practices. I think we we need to continually reinforce the values because that is what makes it work. [AT] On your blog you mention you care about ‘humanising the workplace’ – what do you mean by that? [CC] Organisations and machines don’t build great products and services, people do. It is the collaboration and the human spirit that are at the heart and mind of great work. We need to stop viewing people as ‘resources’; treating them as robots or commodities who are easily interchangeable. We need to enable performance rather than manage performance. The importance of people is reflected at this year’s conference with a whole stream dedicated to building people oriented-organisations through Individuals and Interactions. Humanising the workplace is about making a work environment that puts a greater emphasis on knowledge, passion, inspiring people to collaborate towards common goals, and fostering teamwork where creativity can flourish. We need to adapt the models, processes and restrictions of work to fit humans better. It may seem obvious when I say this, but as an Agile Coach I have spoken to many people about how alienating the workplace can get. I think we have improved a lot in this area over the years, but we need to be very careful we don’t turn Agile processes into Waterfall 2.0. [AT] What is the strangest situation you’ve applied an Agile principle to? [CC] I use Agile in range of situations including creating Kanbans for moving house, big visible charts for our kids’ reward system, acceptance criteria for household chores and a Santa backlog! To some this might seem strange but for me its a way life. I have even got my wife limiting her WIP and using Kanban! You can get more information about the publication including past issues at the AgileTODAY website.